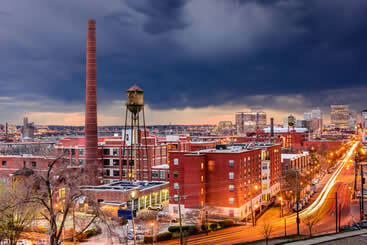 For a look into a metropolis that has old charm old and new style, visit Richmond, Virginia, one of America’s oldest cities. Famous for being the city where Patrick Henry shouted, "Give me liberty or give me death," there is history hiding in every corner. Odds are, the founding fathers of this country knew exactly what they were getting into when they settled such an amazing city. Due to its proximity to the Washington D.C., the strategic importance of Richmond City increases many folds. It is an economic hub, offering jobs and a good lifestyle to millions of Americans. These are the reasons why Richmond is so important for the US. Furthermore, due to the presence of fewer crowds the processing speed increases to a great extent. Due to this along with other reasons; like gentle security checking process, good food options, easy access to city from here; locals of the nearby cities prefer this airport over Dulles in the Washington D.C., despite the latter being the bigger one. The airport is a must visit place. You should definitely get here whenever you visit Washington D.C. or any other place nearby. RIC Airport is the flying facility in the area serving scores of people on a daily basis. It is present on the eastern edge, in the outskirts of the city, attracting people from the adjoin areas as well. It offers free Wi-Fi allowing you to stay connected with your loved ones over the internet. The airport is a small facility used both for civil as well as for military purposes. Most of the flights which fly here are domestic ones. It is a spacious building with parking present near the ticketing and luggage area. You don’t need to walk a long mile from the parking lot like you do in many other airports here in the US. Virginia’s Richmond International Airport is technically located in Sandston, which is located 7 miles southeast of downtown. Because Sandstone is an unincorporated community, you’ll most likely not see a lot of taxis line up outside the gate, which makes it that much more vital to contact us for one of their many shared ride vans, each one offering public-like transportation, giving you the benefit of bag-handling as well as a low fair. 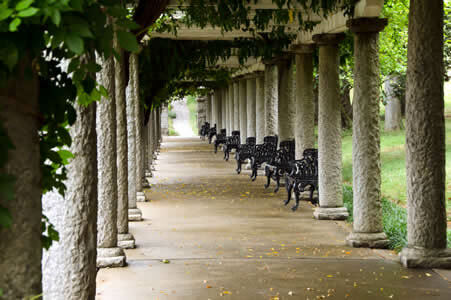 For hefty groups looking to explore the intimate, yet bonding areas of Richmond like Maymont, a Victorian estate with gorgeous gardens and incredible hordes of wildlife, from birds to mammals. Arrive to the tranquil spot by scheduling a private van, going on a walk through Downtown Richmond, which is a historic area filled with fun shopping, urban parks, and an unending nightlife. The Virginia State Capitol is open to the public and home to the state’s famous legislature, surrounded by some of the most iconic elements of governmental architecture. Visit today and go as an intimate group by booking a private sedan, walking through the historic corridors with someone you care about Afterward, head out to Hollywood Cemetery, the famous American Civil War resting area. If you’re a group of readers or a family that simply adorns the genre of Horror, visit the Edgar Allan Poe Museum for a variety of photos, memorabilia, and a raven room. You can get everyone there by reserving a spacious and comfortable private SUV. Afterward, take the car out to the Science Museum of Virginia, which is host to a variety of interesting exhibits, from the micro-world of DNA to the cosmos. Go out for Greek at Stella’s, a tasty bistro that serves modern plates at the heart of classic European décor. You can show up to one of the many gorgeous locations by reserving a stretched limousine from area limo companies, which have a vast list of luxury vehicles. When you’re all done with supper, have a sip of delicious wine from the Crowne Plaza’s chic lounge, which also happens to offer fun cocktails. Richmond has a small population, creating a broad sense of community that can be felt in virtually any location. Because of this, all groups of travelers should feel safe while exploring, whether they’re visiting the historic museum at the 1812 home, The Valentine, or walking over to Pasture, a famous restaurant known for its Southern comfort dishes. Get there together by reserving a chartered bus, avoiding any and all risk of getting split up in an unfamiliar place. The Maymont is a massive Victorian mansion and estate turned Public Park that sits on the outskirts of the city, giving it an all-exclusive, yet all-inclusive feel. Transformed into a historic house by the National Register of Historic Places, the mansion has its own museum, arboretum, and formally arranged gardens, not to mention a Children’s Farm that’s perfect for the whole family. If you’re in the mood to see endless fields of some of the most beautiful flowers, visit Lewis Ginter Botanical Garden for a wide variety of gardens, from Asian to Victorian. 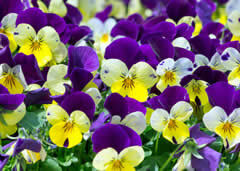 The area is especially known for its unique Healing Garden, a space visited daily by the sickly, the tragedy-stricken, or simply the weary of unfortunate luck. 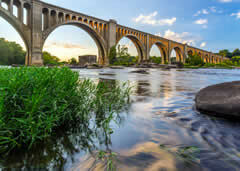 The James River is a huge stream that runs through the entire state, making for a fun afternoon of rafting or fishing. As a connector to the Jackson River, the James attracts millions of people year-round and is filled with a network of activities, from the Appalachian Mountain trails to the Iron Gate. Richmond International Airport is the central transportation hub of the city and is home to seven different commercial airlines as well as a variety of parking and rental services, all of which offer each flier as much convenience as possible. If you’re in need of ground transportation, Richmond International offers several rental car services, from sedans to vans as well as taxis waiting outside the gate. If you’re in a large group and are traveling on a budget, The Greater Richmond Transit Company offers affordable public rides through their buses. If you’re looking for a low-price hotel that includes free Wi-Fi as well as complimentary breakfast, visit Quality Inn & Suites for a comfortable and efficient night. For a trendier look, reserve a night at the Hilton Richmond, which is not only downtown, but also high-chic, offering the best deal with its own complimentary shuttle and business suite. Millie’s Diner is an all-American brunch spot with seasonal dishes that take Main Street to another level. Later that night, be sure to sit down for a cozy dinner at Black Sheep, a restaurant that specializes in creating a hip atmosphere with southern delicacies. If you get bored with the everyday attractions in city, you’ll be sure to be amazed by the astounding amount of historic sites Richmond holds. Whether it’s the Maggie L. Walker House or the Virginia War Memorial, you’re sure to unlock a buck of treasures that you never knew about.